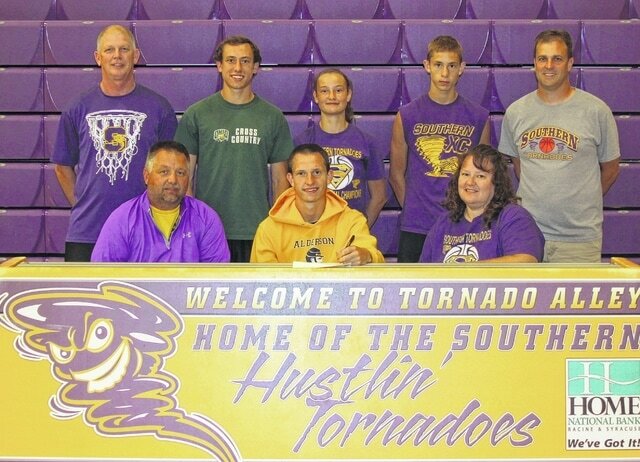 Southern multi-sport standout Tristen Wolfe signed his letter of intent recently at SHS, committing to join the Alderson Boraddus men’s basketball team next season. “Going to Alderson Broaddus just means that my hard work has paid off,” Wolfe said. “It was a good senior year, very memorable, I made lots of memories with fun people and I had a great time at Southern.” Wolfe, a 6-2 southpaw who is the 10th boys basketball player at Southern to surpass 1,000 career points, finished his senior season with 21.4 points per game, 8.2 rebounds per game, 2.5 assists per game, 2.4 steals per game and 2.0 blocks per game. Tristen earned All-TVC Hocking honors three times in basketball, winning at least a share of league MVP honors twice. A three-time AP all-district first team selection, Wolfe has been All-Ohio special mention three times for the Tornadoes. Tristen was the District 13 player of the year this past season and has been named the the District 13 first team three times in basketball. Tristen aided Southern to a pair of sectional crowns in his four years, while helping the Tornadoes claim a share of their first ever TVC Hocking boys basketball title as a junior. “I’m really happy for Tristen because he deserves it,” SHS head coach Jeff Caldwell said. “He has a tremendous work ethic and the time that he put into his game during his high school career made him a great high school player. I’m sure he will continue to work hard and give himself every opportunity to be a really good college basketball player.” Tristen has also excelled on the gridiron, earning two All-TVC selections and two AP All-District first team selections for the Purple and Gold. Wolfe, who was an All-Ohio third-team defensive back as a senior, was named All-Ohio special mention after quarterbacking the Tornadoes to their first ever playoff berth in his junior season. Tristen won three TVC Hocking championships as a senior in track and field, and he advanced to the Region 11 Championships in the long jump and the high jump. Wolfe, who was Southern’s Valedictorian with a 4.425 grade point average, will major in bio-chemistry at ABU with plans on becoming an anesthesiologist. Pictured above, sitting in front from left, are Joe Wolfe (father), Tristen Wolfe and BettyAnn Wolfe (mother). Standing in back are Tornadoes assistant Steve Randolph, Kody Wolfe (brother), Baylee Wolfe (sister), Conner Wolfe (brother) and Southern head coach Jeff Caldwell.